The following is taken from interviews with Betty Bolden by Meredith Levin, the Burke Library’s interim Head from 2016-17. Betty will be retiring in December 2017 and will be greatly missed by her many colleagues and friends! 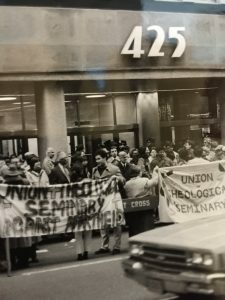 After nearly 50 years at the Burke Library, Betty Bolden, one of Union Theological Seminary’s most beloved community members, is ready to begin her much-deserved retirement at the end of 2017. I had the privilege of working with Betty last year in my role as the Interim Head of the Burke and I’m so grateful that I was able to learn from her. Recently, I had the chance to sit down with her one more time and ask about her many experiences in various roles at the Burke. Below are excerpts from our conversation. What’s the strangest library request you’ve ever received? It’s been nearly 5 decades since you first walked through the doors of the Burke. How has the library changed? There are more people than ever in the main reading room. In the last 3 years in particular I’ve noticed that the library is really full again. I think people still like books. I certainly still buy books myself. We’re coming up on a big anniversary in this neighborhood. 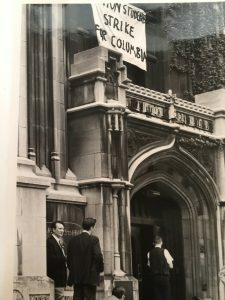 Spring 1968 saw sit-ins at Columbia (and at Union), protests over civil rights issues, the Vietnam War, and students vocally opposing academic administration in unprecedented numbers. What do you remember about those events? I remember that when the Union sit-in began I couldn’t get into work because the building was totally locked down. I had a friend, a 1st year student at the seminary, who let me in and I just wandered the building all day long taking everything in. Later in the afternoon some reporters arrived and began interviewing professors out on Claremont Avenue. Some members of the old guard, like Daniel Day Williams, were very upset by these events because it meant that seminaries were really changing. UTS students were also in close contact with Columbia students. What was happening on the Columbia campus resonated with Union students and vice versa. It was really an exciting time- students everywhere were invested in activism and social justice issues, particularly around the Vietnam War. How many different Burke Library directors have you worked with (and outlasted)? 8 directors! One who stands out was Father Molloy- he was very nice and taught me a lot. I remember him wearing the fanciest, tailor-made clothes and driving a Mercedes. He was quite a character. He later went on to work at the Smithsonian and I think at SMU. So, it’s been a while, but how did you get your first job at the Burke? I had never heard of Union. I was living in Brooklyn at the time looking for jobs and I had gotten an offer for an agency in the South Bronx. My brother told me not to take that job because he said it was too dangerous so I kept looking. I had a friend who worked at General Theological Seminary and when we met for lunch one day her boss who offered to introduce me to the HR person up at Union. I came to Union for my interview and there were two open jobs: 1 in an office and 1 in the library. I decided I would prefer the library job so I took it and I first worked as a circulation assistant. In those days, Burke had a large staff and I remember the big card catalog drawers that could open on both ends so staff members and patrons could access the cards if they needed to. The Missionary Library had its own separate staff of 4-5 people and the Religious Education Library was up on the 5th floor. The Sacred Music Library was also located in the two rooms behind the main reading room on the 3rd floor. What will you miss most about working at the Burke? Daily contact with the students and interacting with special collections readers from all over the world. The Harry Emerson Fosdick Papers and the Near East Relief Committee Records are some of the most heavily used collections, along with those of Dietrich Bonhoeffer and other major theologians. Some collections I’ve recently become interested in are the East Harlem Protestant Parish Records and the Student Interracial Ministry Records from the 1960s. What advice would you give the person who takes on this job after you? This is very physical work- heavy boxes are no joke! But this job enables you to work with so many different people and you’ll learn a lot from folks around the world. Once you start to know the collections better you’ll be able to refer people to other materials and that makes your interactions with readers even more special. Any big plans for retirement? In March 2018, I’m going to South Africa for 3 weeks. It’ll be my 3rd time in S. Africa but my first trip just as a tourist! The first time I went was in 1996 on a Plowshares trip and I went again in 2001 for a UN conference in Durban on homophobia/xenophobia. Then I’m planning on taking a writing class, learning how to sketch and paint, and I’d like to volunteer in my community in the Bronx with formerly incarcerated people. If you could go back to 1968 and give newly hired Betty some advice about working at the Burke, what would it be? I wouldn’t warn her against anything. I was innocent when I started working here and I’m glad I came in with an open mind. I’d say to expect the unexpected and you’ll have fun. Thank you, Betty, for your wisdom, kindness and mentorship to countless students and researchers who have visited the Burke. We wish you all the best and will miss you! This entry was posted in Collections on December 6, 2017 by Matthew Baker.